The newest luxurious midsize Toyota sedan is now available at your Fort Collins, CO Toyota dealer. The redesigned 2019 Toyota Avalon bridges the gap between the Camry and its Lexus sibling, the ES 350. This latest fifth-generation model makes all the expected improvements over its predecessor with more features, a stronger and more sporty performance, added refinement and more safety features and fuel efficiency than ever. Completely redesigned for the 2019 model year, the best-in-class Toyota Avalon offers more features than ever before. Available in XLE, Limited, XSE and Touring trims, the 2019 Toyota Avalon for sale in Fort Collins is equipped with the latest infotainment system, which includes Apple CarPlay smartphone integration, as well as Avalon’s next-generation Entune 3.0 system with a large 9-inch touch-screen display with pinch-and-zoom navigation controls and the ability to connect up to five devices using onboard Wi-Fi Connect. Powered by a 3.5-liter V6 engine, which delivers up to 301 HP and up to 267 lb.-ft. of torque, this midsize sedan is also equipped the Avalon’s new Adaptive Variable Suspension (AVS), which provides instantaneous damping adjustments to maximize handling and stability on all roads. An available rear spoiler, diffuser and even underbody panels also help shave this luxury Toyota model’s coefficient of drag, which increases fuel efficiency and aids in improving the sound of silence inside this sporty sedan. What is the best thing about owning a luxurious sedan like the Toyota Avalon? Obtaining a sedan with the kind of luxury that isn’t available in any other. Available with Cognac Leather trim with heated and ventilated front seats, a quieter cabin, genuine wood dash and door panels and a large center instrument panel with 9-inch touchscreen you can rest assured that you are traveling in the age of real automotive refinement. For those who prefer their luxury with an edge, step up to the XSE model, which offers a sunroof, a rear spoiler, augmented engine intake noises, paddle shifters, aluminum interior trim and microsuede seat inserts. Toyota’s newest suite of active safety features are also standard on each model of the all-new Avalon. 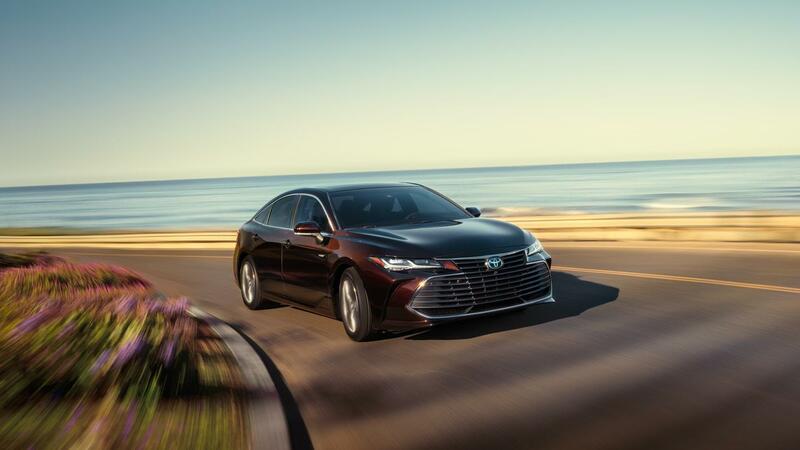 So, whether you are looking for a luxury vehicle that offers a birds eye view of the entire vehicle from the cockpit or one that warns you of nearby pedestrians or other vehicles you can rest assured that the 2019 Avalon has you covered. This high-class Toyota even offers adaptive cruise control, an automatic emergency braking system and a no cost maintenance plan with 24-hour roadside assistance to assure that each adventure is safer than the last. So, what are you waiting for? Don’t miss out on your chance to test drive the latest in Toyota sedan luxury at Pedersen Toyota today!